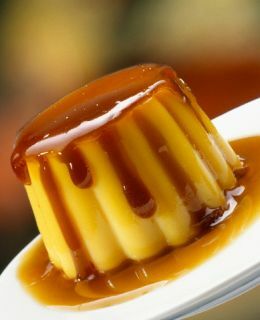 Crème Caramel is classic and quick elegant dessert, but it is also the sweetest temptation. Melt 1/4 of the sugar in a non-stick pan. When the sugar is turned into caramel pour it in the 8-10 small pots (cup size) and cover only the bottom. Boil the milk and add the rest of the sugar, the eggs and the vanilla. Stir well the mixture and pour it into the small pots above the caramel. Place the small pots in a baked pan. Pour 3-4 cups of water in the pan (sinking pots to the middle). Bake in an oven at 300°F (150°C) for about 30 minutes. Turn the crème over in a dessert plate. Bon Appétit!